The fingerprint of global warming has been firmly identified in the increasing intensity, duration and frequency of extreme heat events. The trend in warming has contributed to the probability and magnitude of 82 percent of record-hot days observed globally. It is within this context that mid-June temperatures soared 15 to 30°F above normal across the Southwestern US, from California's Central Valley, to Las Vegas, and down to Phoenix. High temperatures are typical before the Southwest monsoon season; however, the extreme — record-breaking — nature of the event is a classic signal of climate change. This is the second of two back-to-back years of extreme heat in the Southwest during the pre-monsoon season. Heat waves have generally become more frequent across the US in recent decades, with western regions setting records for numbers of these events in the 2000s. All-Time Extreme Heat Expected in Southwest U.S.
Four out of five record-hot days globally are now amplified by the trend in global warming. In the US, western regions set the most records for the number of heat wave events in the 2000s. Heat waves have become generally more frequent across the US in recent decades. 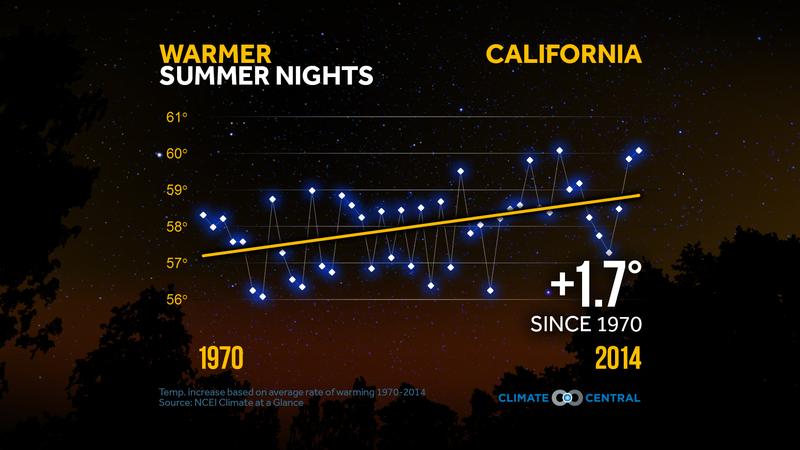 There has also been a dramatic increase in nighttime temperatures in the US, reducing the number of critically important relief windows during heat waves. During what's been called the USA's most extreme heat wave in years, Las Vegas tied its all-time record high temperature of 117°F Tuesday. Needles, California also tied its all-time high of 125°F. Tucson sweltered to its hottest three-day stretch ever. Wednesday's 115°F high there was the third consecutive day the city reached that measurement. In addition, 12 of Tucson's 30 June record warm lows since 1894 have occurred in the last five years, and 16 occurred since 2000. The heat has been blamed for four deaths in Nevada, two deaths in New Mexico and one in California. More than 40 flights out of Phoenix were delayed or canceled when temperatures exceeded the maximum operating temperatures of the planes. "As we push the climate out of the historical realm and into this new realm, we are starting to see some systems break down." - Robert E. Kopp, Director of the Coastal Climate Risk and Resilience Initiative at Rutgers University. Record breaking temperatures are a classic signal of climate change. Records tend to be broken when natural variation runs in the same direction as climate change, towards hotter temperatures in this instance. This particular event is driven by a massive heat dome settling over the southwest, a high pressure ridge in the upper atmosphere. Heat domes of this intensity are rare but have recently become more frequent in the West. Looking through records back to 1958, researchers have found that almost all of the high-intensity heat domes have occurred since 1983 — with the overwhelming majority of them occurring since 1990. The highest temperatures of the year in the Southwest typically occur in late June and early July, before the arrival of the summer monsoon. Exactly one year ago, in June 2016, the southwest had a very similar "record breaking" extreme heat event. Back-to-back record heat events is consistent with the global trend: increasing frequency of extreme and record breaking heat events. There has been a dramatic increase in hot night-time temperatures in the US, reducing the number of critically important relief windows during heat waves. The increase in hot night-time temperatures is linked to both increased average temperatures and the increased water carrying capacity of warmer air (when fully saturated), which traps heat close to the surface. While California and the Southwest often experience dry heat, an unusually strong atmospheric river over the Pacific Northwest led to increased atmospheric moisture in California’s Central Valley that trapped heat low in the atmosphere and elevated overnight temperatures. In a stable climate, the ratio of days that are record hot to days that are record cold is approximately even. However, in our warming climate, record highs have begun to outpace record lows, with the imbalance growing for the past three decades. The trend in global warming has been found to have contributed to at least 82 percent of the heat records globally over recent decades. A small shift in climate leads to a dramatic increase in the frequency of temperatures at the high end. The very most extreme events are the events most affected by climate change.